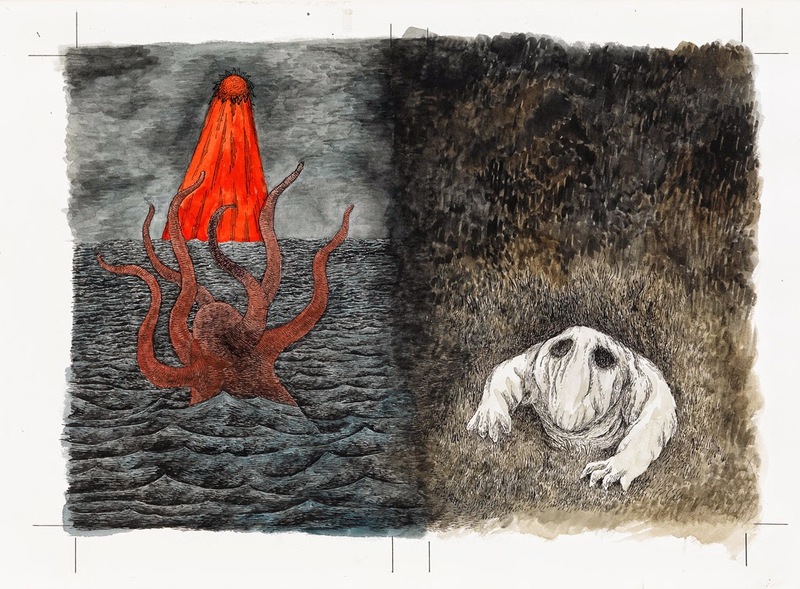 The upcoming auction of Illustration Art on January 22, 2015 at Swann Galleries in New York City features three pieces of original art by Edward Gorey. 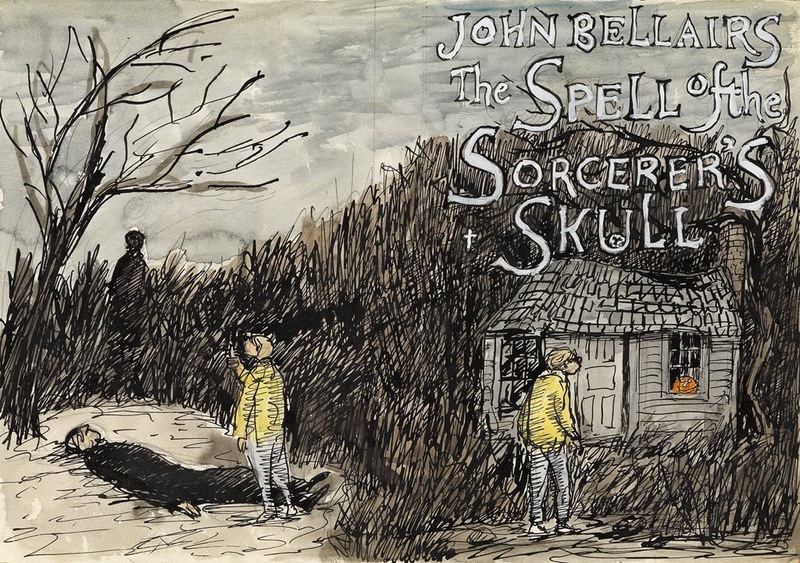 The first item is the preliminary sketch for the wraparound dust wrapper of The Spell of the Sorcerer's Skull by John Bellairs (1984). It is interesting to compare how closely the sketch and the final artwork match (see my post from February 16, 2010). The next piece is the complete finished art for Haunted America, a compilation of ghost stories by Marvin Kaye (see my post from January 6, 2014). This is a wonderfully vibrant image that was severely cropped on the final publication. Swann sold the preliminary artwork for this piece at the January 2014 Illustration Art Sale. 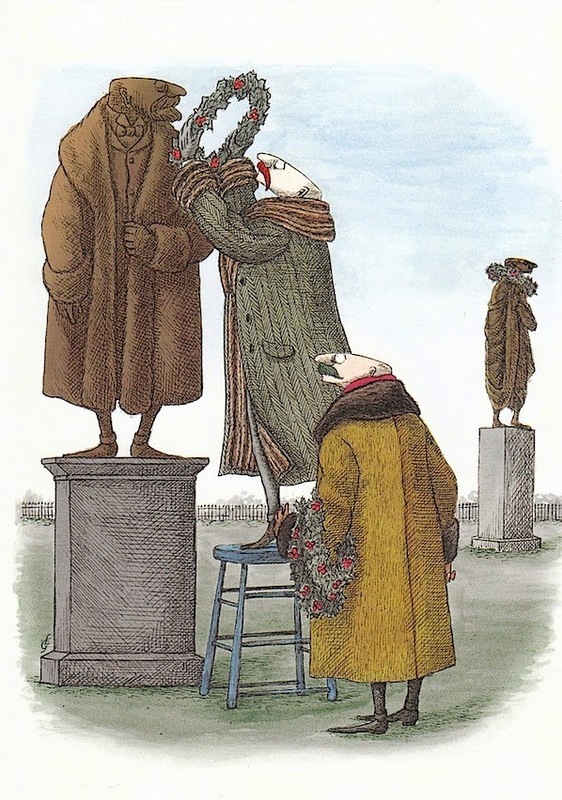 The third offering at the sale is Edward Gorey's final book illustration project before he passed away in April 2000. 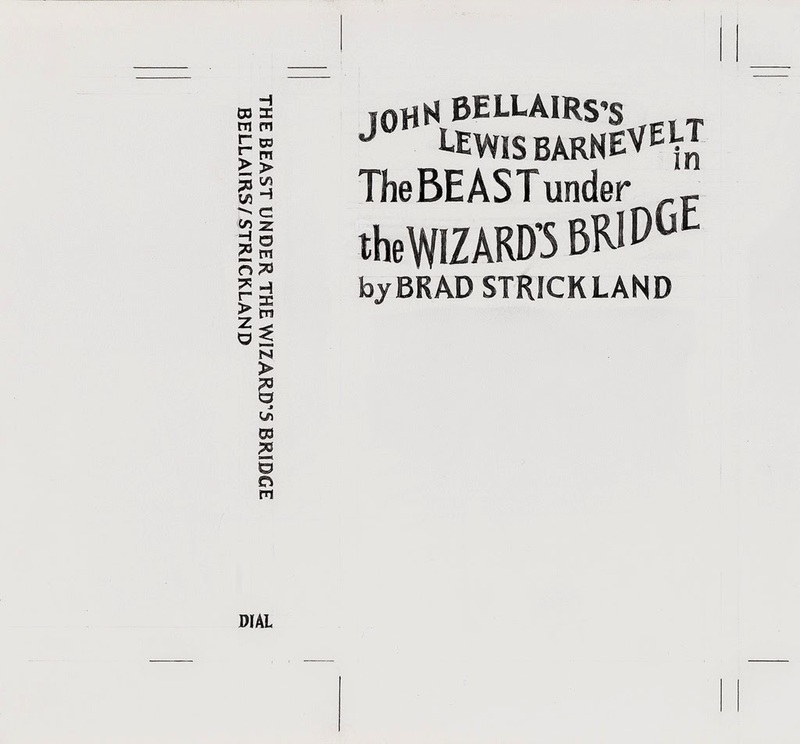 The Beast Under the Wizard's Bridge lot includes the separate artwork for the hand lettering on the cover and spine of the book. While visiting the Boston area in early November, we were delighted to find that the time of our visit coincided with the annual Boston Book Fair. We found many new dealers to get to know, and lots of wonderful items to inspect. We even came away with a few new treasures for our collections. Book fairs are a fantastic way to expand your collections and knowledge. Even in the booths with items that do not pertain to our specific collecting interests, we can learn more about the world and the records left behind. It is usually true that a dealer will have a specific area of interest and knowledge, and that they are happy to inform the curious about the pieces they have brought. The danger, of course, is that you will find something that you didn't realize you suddenly need to have! It is also true that not everything is on the Internet! At the book fair, we came away with several items that were not listed at online stores or websites. One such item that I was able to add to my collection was the limited edition copy of Light Meters by Felicia Lamport, illustrated by Edward Gorey. 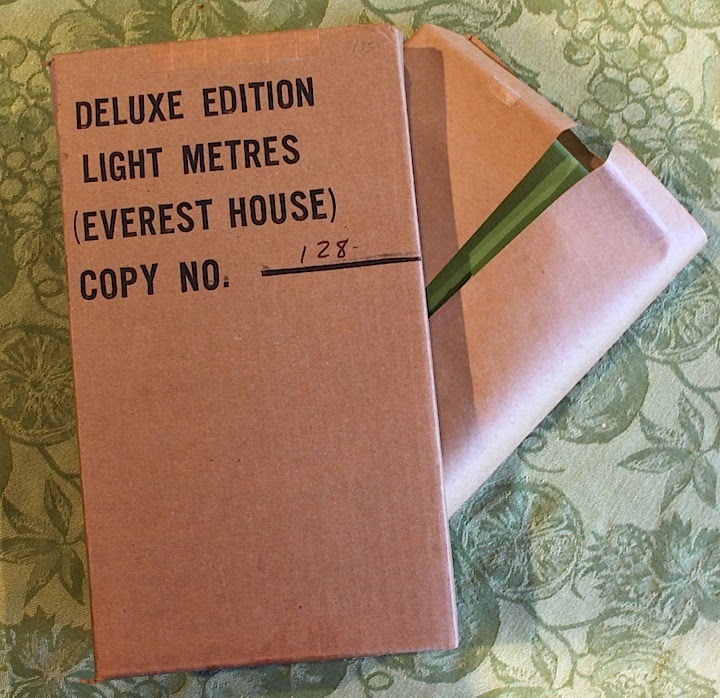 Light Meters was published in 1982 in a limited edition of 350 numbered and 26 lettered copies. 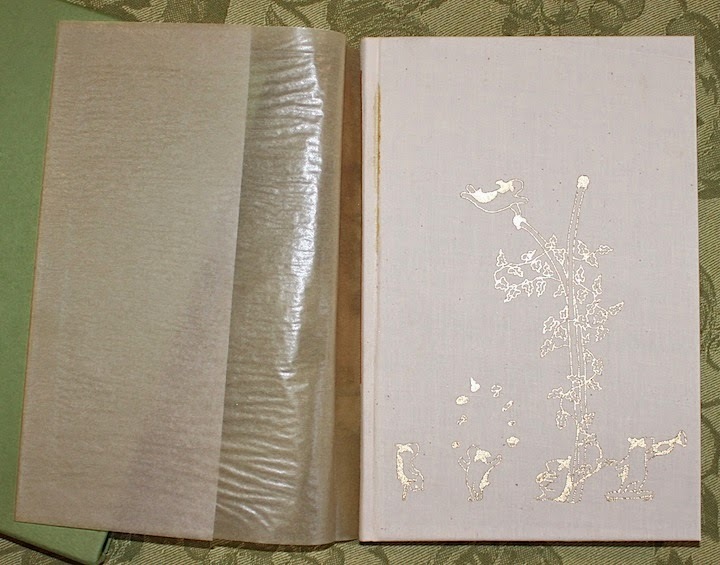 Each of these copies were protected with a fragile glassine dust wrapper and slipcased. 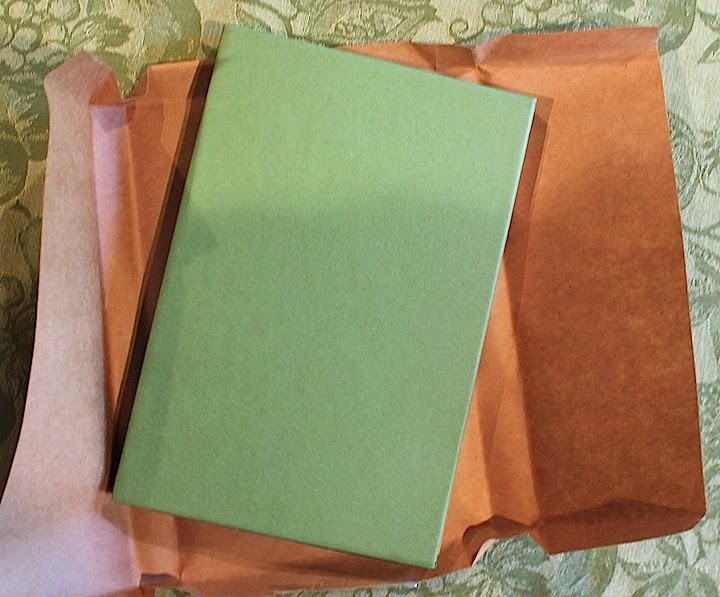 The copy I found at the fair was number 128 in mint condition in the original packaging - including the original brown paper wrapping inside the printed mailing box. 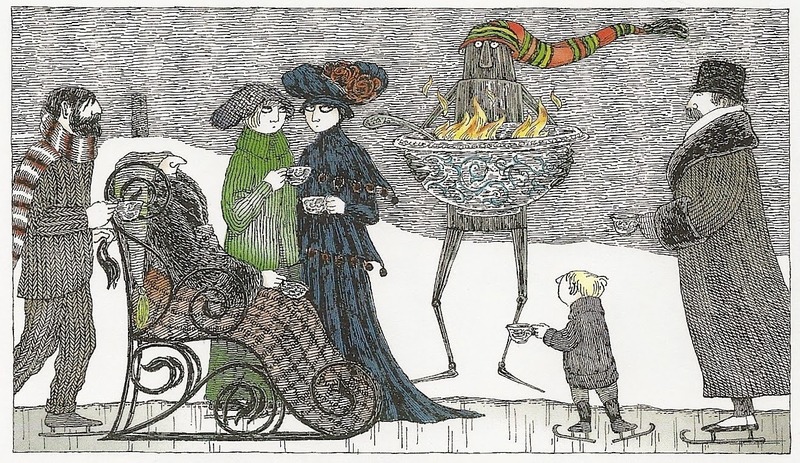 Robots appear in illustrations throughout Edward Gorey's career. As a child and early teen in the 1930's, young Edward would have spent Saturday afternoons playing with friends and going to the movies. Movie serials became part of the Saturday afternoon theater experience in the mid-30's, with weekly installments of thrilling adventures, each ending in a cliffhanger for the hero or heroine. 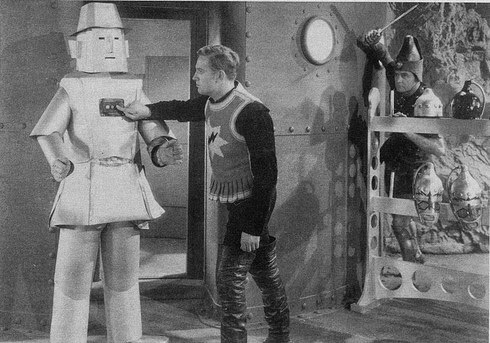 Many of these serials included futuristic themes with robots who were sent to do the bidding of a diabolical fiend. This was even true for the cowboy serials featuring Gene Autry! In 1961, Edward Gorey illustrated Scrap Irony, the first of three collections of verse by Felicia Lampert. The robot featured on page 25 appears to be a cross between a piece of furniture and a robot. 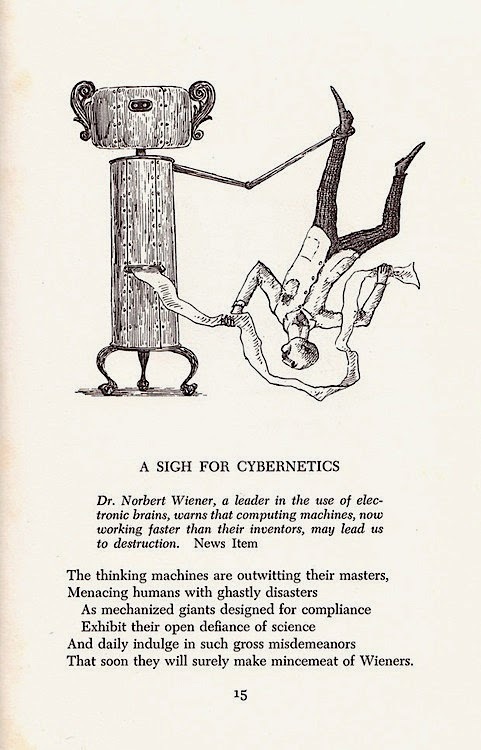 As with robots in the movie serials, this metal creation is supposed to be helpful, but is really thinking for itself and plotting against its inventor. While almost all of the robots in the serial films were malevolent, Mr. Gorey's mechanical creatures tend to be helpful. 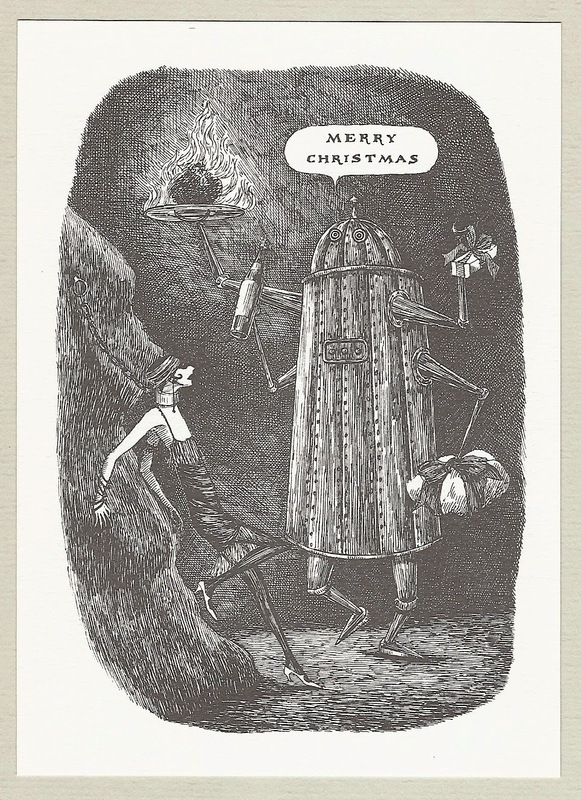 Mr. Gorey also appears to stonghly associate robots with the Christmas season. Perhaps he was given a cherished toy robot as a child for Christmas. Whatever the reason, robots appear with frequency on his holiday cards. One of Mr. Gorey's earliest Christmas robots appears to be conflicted as to whether it wants to be helpful or not. Created in the 1950's, this robot arrives at a remote location where a 1920's flapper has been chained to a rock - but who has chained her there, the robot? The robot gives a cheery "Merry Christmas" and comes bearing gifts in each of its four outstretched arms. Is this a joyous rescue for the heroine, or the cliffhanger to this weeks installment? Will a flaming Plum Pudding really help her out of her situation? Theater on the Bay's 1993 holiday theatrical production of Blithering Christmas features a helpful robot on the program and souvenir button. 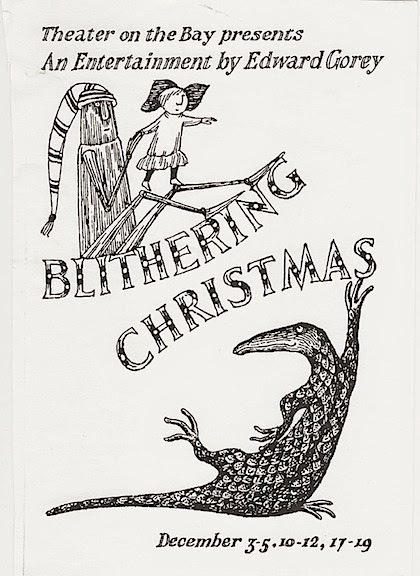 It can also be noted that Edward Gorey associates alligators with the Holiday Season. 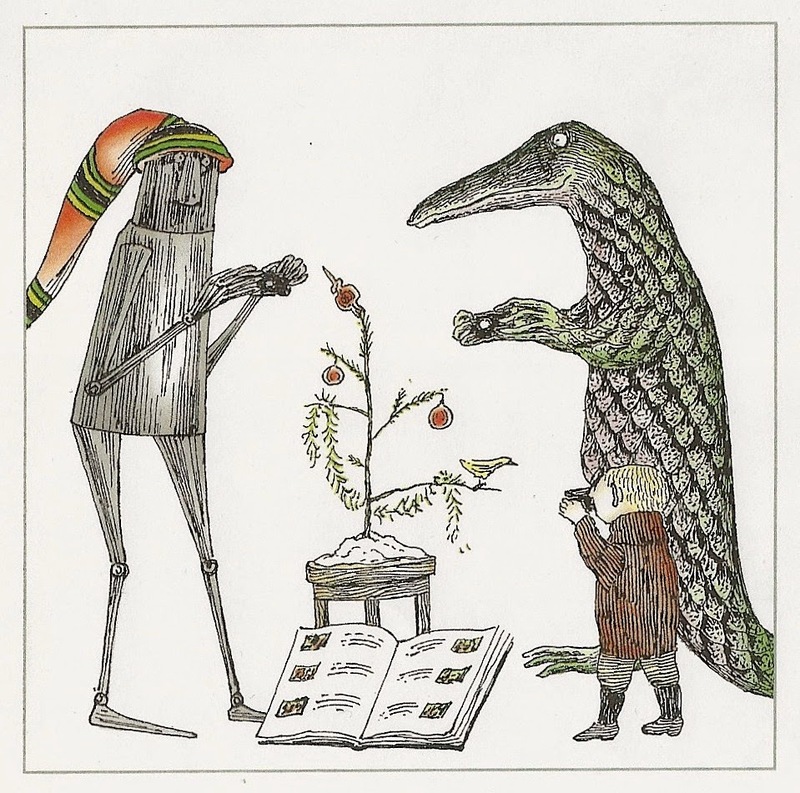 In both Blithering Christmas images, the robot is being assisted by a large reptile to help the small girl. In another image, this same pair appears alongside a small boy, each taking photos of a forlorn Christmas Tree. This helpful reptile also appears without the robot on other Christmas cards. Looking for a gift for the Edward Gorey collector in your life? Or perhaps you are just feeling the urge to buy a book for your Gorey collection? 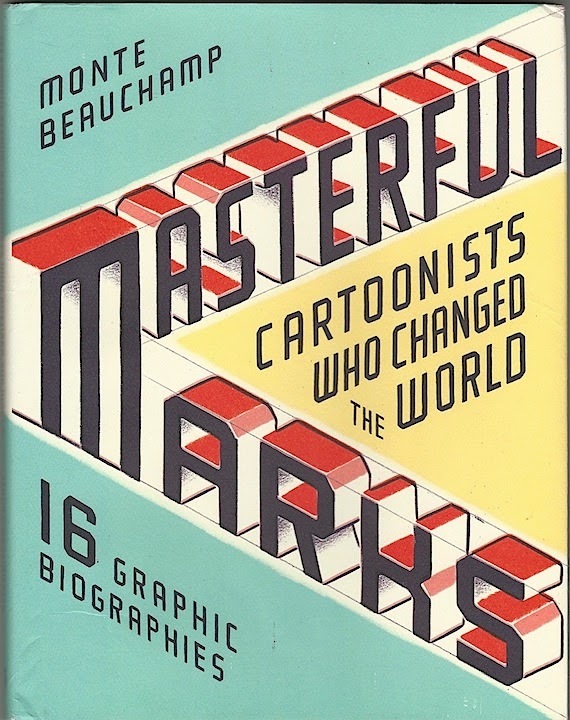 Masterful Marks: Cartoonists Who Changed the World (2014 Simor & Schuster) by Monte Beauchamp is a great addition to any collection. The book tells the personal and professional biographies of 16 cartoon artists in the illustrated graphic novel style by a variety of contemporary artists. A wide range of popular cartoonists such as Charles Schulz, Dr. Suess and Walt Disney reside alongside names that might not be as familiar, such as Rodolphe Topffer and Osamu Tozuka. 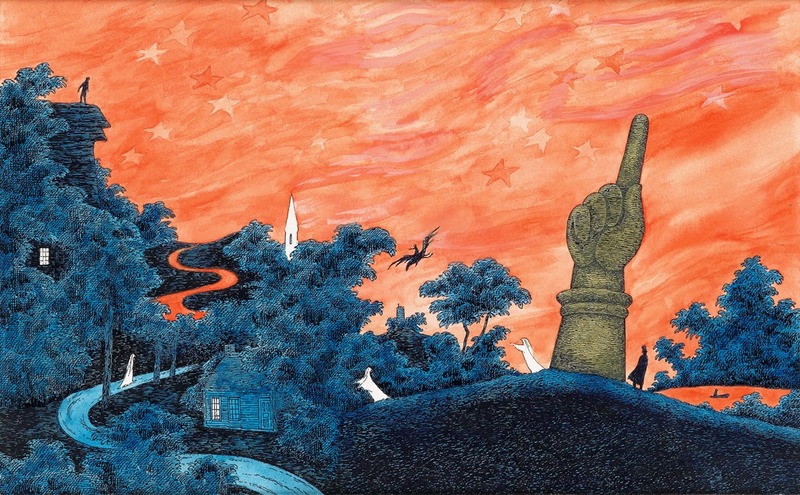 Edward Gorey is presented by illustrator Greg Clarke in a beautiful 6 page spread. All of the biographies are beautifully presented, with well written interesting tidbits of information and fantastic illustrations in an illustrated "Wikipedia" style.